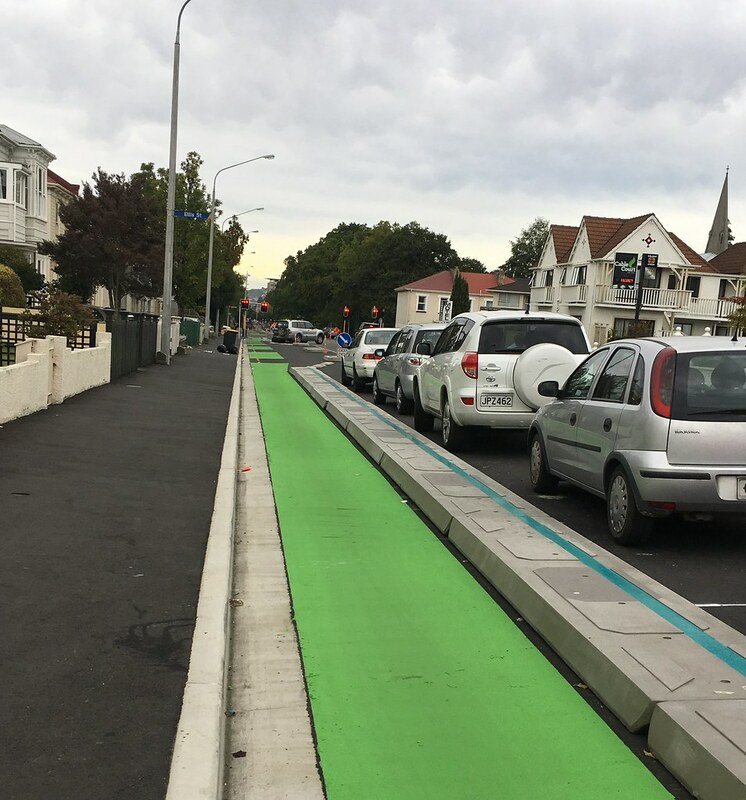 Work started in August 2017 on this project that will significantly improve cycle safety on the one-way system through north and central Dunedin, by providing cycle lanes that physically separate cyclists from highway traffic. This project is about improving cycle safety on the SH1 one-way system through central Dunedin, a busy route that must cater for heavy freight vehicles and general traffic, as well as other road-users including pedestrians and cyclists. This latter group of road users are over represented in crashes on this highway corridor. To reduce the risk of fatal and serious injury crashes, the one-way system needs to be much safer for cyclists as well as pedestrians. A major aim of this project is to provide safe and efficient cycle lanes on this route that make cycling a safer and more attractive transport choice. There’s been a surge of interest in cycling and cycling safety in New Zealand and we want to support and encourage this particularly in our main urban centres including Dunedin. Create better linkages to central city locations including the University, Polytechnic, hospital and the central city itself. Provide more convenient connections to the wider network of urban cycle routes being developed by the Dunedin City Council. Help make cycling a safe and attractive transport choice within Dunedin, further enhancing the city’s appeal as a place to live and work. Encourage more people to take up cycling as a safe commuting choice. Improve pedestrian safety, with new traffic signals planned and existing traffic signal operations being upgraded to increase the protection for pedestrians when crossing. This project, will improve cycle safety on the one-way system through central Dunedin, a busy route that has to balance the competing needs of heavy freight vehicles and general traffic, as well as pedestrians and cyclists. The work involves replacement of the existing painted cycle lanes, which sit directly next to the busy traffic lanes and placing the new cycle lanes alongside the footpath, together with a series of islands to keep highway traffic and cyclists separated. Most of the new cycle lanes will be on the right side of the road which has some real safety advantages: interactions between cyclists and bus stops is largely avoided and, at intersections, truck drivers can more easily see cyclists on their right side, than on the left side (which is often a blind spot for truck drivers); two very busy supermarket access-ways are avoided. At Queens Garden, the two cycle lanes are able to come together as single two-way cycle lane through to Vogel St. However, on the first section of the cycle lanes from Cumberland Street (southbound) between the Botanical Gardens and Albany Street the new lanes will remain on the left side of the highway, where the existing cycle lanes are. 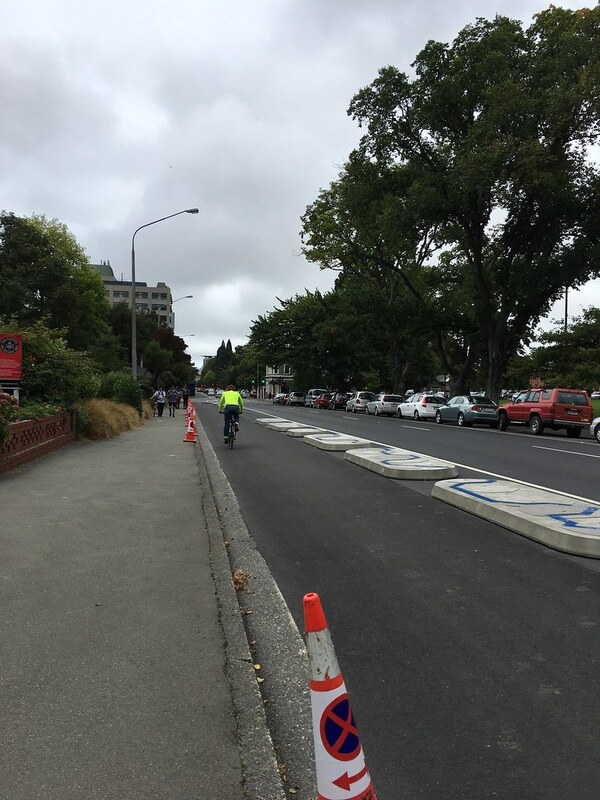 This is so those cycling to the Otago University or Otago Polytechnic do not need to cross and then re-cross the highway. The new cycle lanes mean changes in the availability and use of parking on parts of the one-way system. Initially 390 car parks were required to accommodate the cycle lanes. In response to public and business feedback, a variety of design changes were made to reduce the overall effect on car parking, including creating new parking bays within the cycle lane design, and re-introducing car parks on the opposite side of the highway to the new cycle lane route. These measures reduced parking losses on the one-way system to 210 car parks. Net parking losses have been lowered even further. 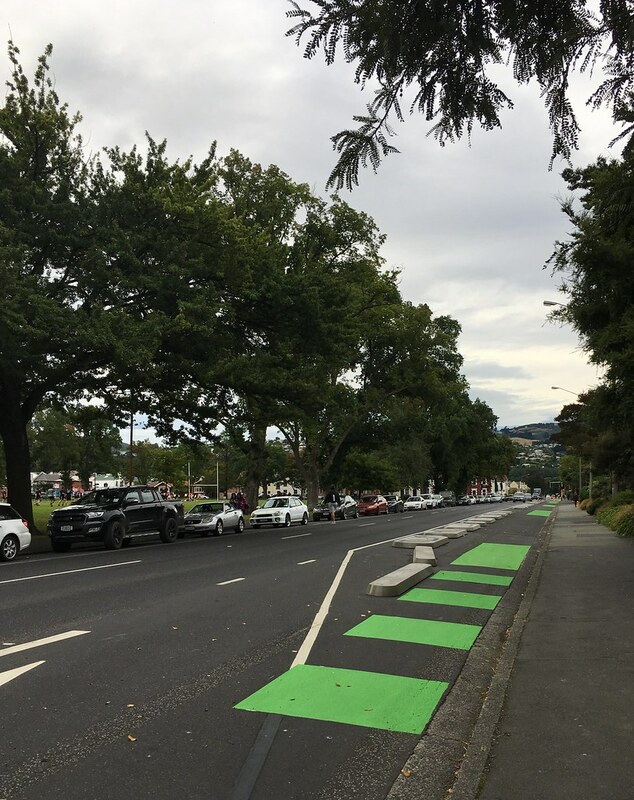 Prior to work starting on the new cycle lanes in August 2017, the Dunedin City Council provided 50 extra parks on streets adjacent to the one-way system, reducing the net loss of car parks to 160. Meeting the parking needs of businesses and maintain access to public facilities has been a big focus of the cycle lane design. Of the 130 parking bays being re-introduced on the one-way system, priority has been given to matching existing business short stay car parks, and parking near Dunedin Hospital, Otago Museum and Otago University. Work got underway in August 2017 on a project that will improve safety for cyclists, pedestrians and all road users on the State Highway 1 (SH1) one-way system through central Dunedin. In July 2017, the NZ Transport Agency awarded Fulton Hogan an $8 million contract to build the new cycle lanes on the north and southbound lanes of the State Highway 1, one-way system between the Dunedin Botanical Gardens and Queens Gardens. 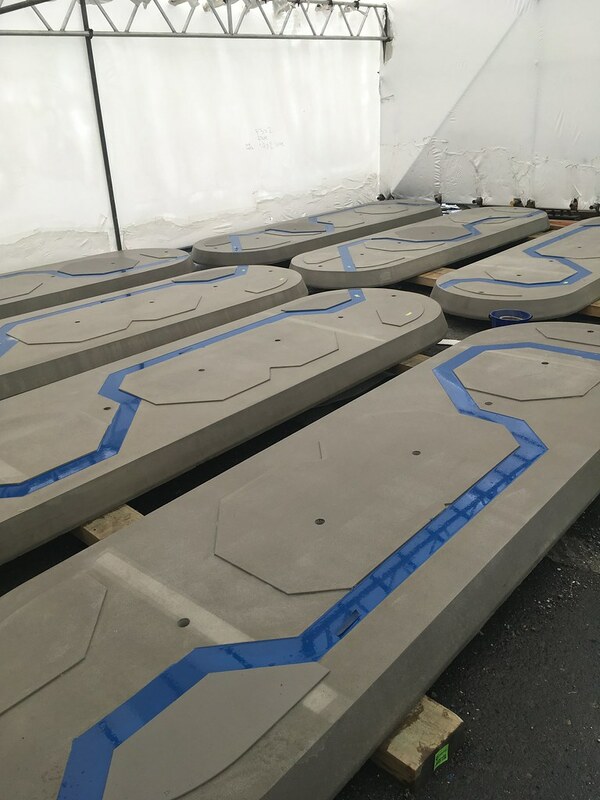 The the project is expected to be officially opened in mid-to-late February 2019. This is one of the early projects in a programme to create a Dunedin transport system with better, safer connections and more choices for people to move around, whether it’s by cycling, walking, driving or catching a bus. This link takes you to the City of Vancouver transport website. Here you can find out about the introduction of separated cycle lanes on Dunsmuir St and Hornby St. These lanes form part of a wider inner city safe cycling network in Vancouver. The City of Portland (Oregon) transport website, where there are details about the gains that city has achieved in the areas of 'active' transport.